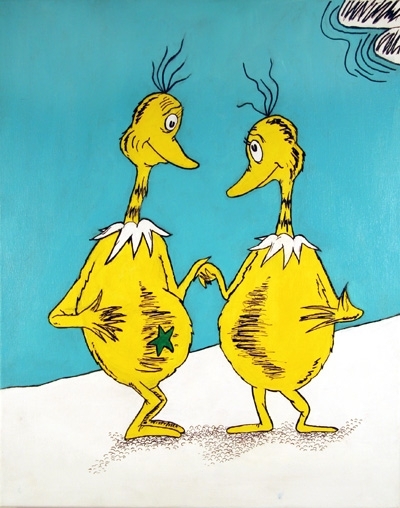 Did you ever read Dr. Suess' The Sneeches? I was thinking about it the other day, and how well-timed it was for me, a regular kid mixed up in the consumer-paradise that was the "Oughts." There were so many things that "defined" you at that age. I only noticed when I moved out to a new school district around 3rd grade. Suddenly kids cared about how much money you had: if there was a trampoline at your house, if your parents went to the Racquet Club, if you could afford Carmellos over candy cigarettes or had 3 American Girls instead of a Magic Attic doll, or if you carried a Tamagachi and a colored Sony CD player, wore Limited Too zip-off pants and Old Navy sweatshirts, and (perhaps least noticeably) bought new school supplies every year, you were solidly "in." I came from a well-off family, but rarely (if ever) did I see my parents flaunt their money. We were able to afford more things as time progressed -- or maybe it just seemed that way as we accumulated more space. We did have a trampoline at one point or another. I had two American Girl dolls -- not to mention a dollhouse, my own room, and enough Beanie Babies to fill an orange crate. We earned an allowance doing basic chores. In time, we even got a dog. That all being said, I grew up understanding that not every kid had it the way I did, and I was taught by my parents that as a child of good fortune it was my duty to donate to those less fortunate than me. I went through bouts of greed and selfishness as every child does (sometimes adult-me does, too), but in time I realized that it didn't matter whether my least favorite doll sold at a yard sale for .50 or .75 -- it was enough to see her again in the arms of someone who really loved her. We recently had a yard sale near my house and it made me think of all the stuff in my life that I really don't need -- that I would surely benefit from selling or donating. Yet somehow every time I sit down and try to de-bulk I end up hanging on to more than I ought to, out of sentimentality or guilt or... something else. Anyway, I'm going to try and be less concerned with my Sneech-ness in the coming month, and focus more on my goals. Which brings me to Poo-Poo Stars. My parents, being who they are, termed them "Poo-poo stars," though their delegation stretched beyond a timely bowel movement. At this point, I don't really remember which one was for what, but I have a sneaking suspicion that gold was for having a pee -- that only makes sense -- and the subliminal sense of pride I feel when I see that silver one suggests it must've been a top reward star. I can't remember if there were punishment stars. Probably not, since my parents were never ones to dwell on things we did wrong. When they pressed one of those stars on your hand and you got to parade it under your less-trained younger brothers noses all day, the pride was overwhelming. More importantly, it was a sweet reminder that someone out there was rooting for you, even for something as mundane as taking relief in the proper receptacle. I was thinking today that as I progress on this journey toward self-discovery, I might want to rekindle the Poo-Poo Star principle -- reassign rankings to the colors and decide what I deserved from day to day, in terms of self-fulfillment. If I were to journal about my daily triumphs and truly assess what kind of impact I made on my own future and self-worth, would I like what I saw? If not immediately, could I aim to make myself like what I saw? It's important to me to become better in-tune with my blessings, for, as Amy March sighs in Little Women "I'm a selfish girl..." so often and in spite of my luck. So, for the month of August, I pledge to create my own stars-upon-thars, embrace my inner Sneech, and stop caring about the stuff that isn't Rachel, that really doesn't define me at all.